The African violet is North America’s favourite houseplant and no wonder. Practically everyone I know either grows them or knows someone who does. “People love African violets because they are easy to grow and despite the weather outside, we can have flowers all through the year,” says Doris Brownlie of the Toronto African Violet Society. Doris and her husband John run a hobby business, Aca’s Violet Tree. In fact, John Brownlie, a hybridizer, recently had one of his hybrids, ‘Aca’s Red Ember’, make the top 100 list of favourite African violet varieties of the African Violet Society of America. The African violet (Saintpaulia ionantha) is a low compact plant with attractive dark green, thick, hairy leaves. The violet-like flowers are borne in small panicles just above the foliage. Besides the traditional shades of blue-violet, there are also many modern hybrids with flowers in shades of pink, fuchsia and white and with single, semi-double and double rows of petals. Some have white edges, coloured edges, dots and streaks in varying hues, to name just a few of the variations. There are also many different leaf shades and shapes. The African violet really is an African plant, “discovered” in East Africa by the German Baron Walter von Saint Paul in 1892 and brought to North America in 1926 when seeds were imported from German and British greenhouses. More than 20 wild species have been found to date. African violets adjust well to the warm temperatures and dry air of our Canadian homes. They require good light, but direct sunlight is not necessary. Windows facing north or east usually provide the best light exposures. 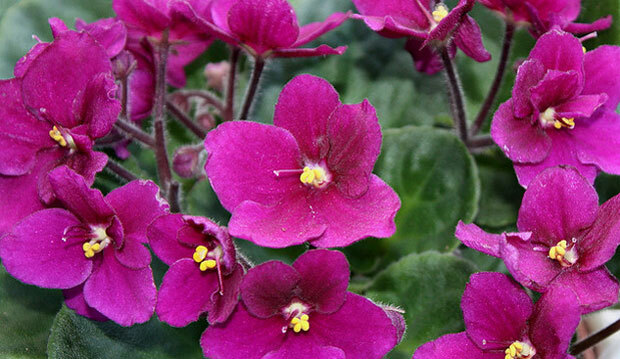 African violets prefer a porous soil, or a pasteurized soilless mix of peat moss, vermiculite and perlite, that allows surplus water to pass through easily. Most growers recommend regular fertilization every time you water. Use a 20-20-20 mix or one slightly higher in phosphorus such as 12-36-14, diluted one millilitre to 4.5 litres (¼ teaspoon per gallon) of water. Groom regularly by removing dead or dying foliage and flowers. Routinely rotate plants one-quarter turn every time you water to assure even growth. Remove suckers, those tiny plantlets that sometimes grow between the leaf axils. Keep plants free of dust and soil particles by dusting with a soft, natural bristle brush. Inspect plants frequently for problems such as thrips (tiny off-white to beige insects that look like little bits of thread on the blooms), mealy bugs (that look like minute cotton balls hiding near the base of the leaves or in the soil), or mites (tiny eight-legged spider relatives that hide under the leaves). The non-chemical way to treat plants with thrips is to disbud them for a period of six months to prevent them from blooming. Control foliar mealy bugs by picking them off by hand and/or wiping them away with a swab dipped in alcohol and then rinsing the plant in lukewarm water to avoid alcohol damage to the leaves. To control soil-based mealy bugs, use a soil drench made of a chemical insecticide. While chemical miticides are available, it is difficult to defend against a mite infestation. Many experts recommend throwing out mite-infected plants before the pests spread to other plants. Isolate new plants, preferably in another room, for at least six weeks and always wash your hands after handling them. Keep outdoor plants away from African violets to avoid exposing them to minute insects. Use only pots and saucers that have been washed, rinsed and soaked in a chlorine bleach solution (1 part bleach to 15 parts water) and rinsed again. This prevents eggs and spores that may have been present in used containers from transferring themselves to your new plants. Space plants well apart. Crowding them or allowing them to touch each other will reduce air circulation, which increases opportunities for fungal spores to take hold. Treat fungal disease, including mildew, botrytis blight and crown rot, by dusting leaves with sulphur, then brushing it off in a few days. But be very careful when using sulphur as it can cause an allergic reaction to humans when used indoors.